Who is Vitthal God? – Which God in Hinduism is known as Vittal? Vitthal, or Vittal or Vittala, is a very popular God worshipped in Hinduism. So who is Lord Vitthal? Which God is worshipped as Panduranga Vittala in Hindu religion? Vitthal is the manifestation of Lord Krishna. Vitth or Veetha means brick and Vitthal is one who stands on a brick. Lord Krishna is worshipped as Vitthal. Panduranga, an ardent devotee of Vishnu, was so immersed in taking care of his parents that when Krishna knocked on his doors, he asked the God to wait and gave him a brick to stand on. Krishna was so impressed by Panduranga’s devotion for his parents that he stood on the brick waiting for his devotee. 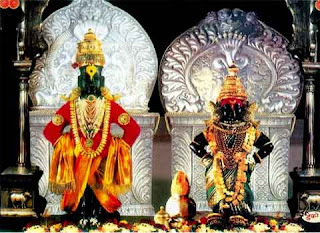 God Vitthal is worshipped along with Goddess Rukmini at the famous Pandarpur Temple in Maharashtra.